Leading Supplier and Manufacturer of Chemical Plants Lube such as CVC Galvanizing Spray, CVC Molylube, CVC PCB - 500, CVC Silcolube, Synol WP-100, CVC Tefkote-33 and many more items from Mumbai. Sealant and lubricant for automatic control valves, flow meter bearings, pump packings, on floating telephone batteries, in valves of water softner, on Fire Extinguishers etc. 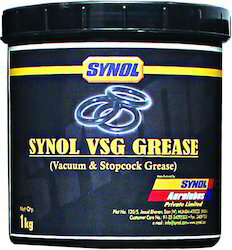 Lubricant for synthetic rubber O-rings, seals and gaskets. Mould release agent for epoxy, polystyrene, polyvinylchloride, polyester resins and other plastics. Suitable for very high vacuum. Release agent for Epoxy Compounds & thermoplastics. 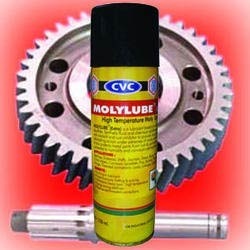 Molylube is clean, dry lubricant, based on molybdenum disulfide, chemically inert, forms a thin tenacious antifriction film capable of withstanding extreme pressures (100,000 psi) and temperatures (-180°C to +400°C). Protects against seizure, fretting, scoring etc. and will free seized threaded connections with deep penetrating and lubricating action. Bearings, slides, ways, shafts, journals, gears, rams, fasteners, chain wheels, conveyor, sprockets, pins, bushes, plungers, springs, hinges, threaded connections, locks, linkages, splines, sleeves, etc. Area of Application:Used in industries like Agriculture, Chemical, Structural, Engineering, Steel plants etc. Is salt water-resistant and withstands temperatures up to 250°C. 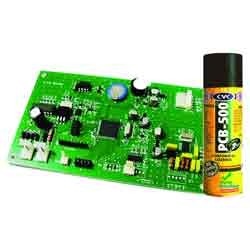 All types of printed circuit boards and assemblies, Electronic components and other parts such as battery terminals, bus bars, transformers, etc. 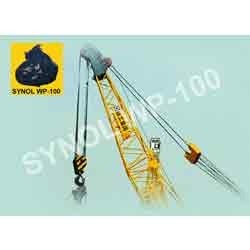 SYNOL ARG - 200 Grease is specially formulated acid/alkali resistant grease with special chemical additives like rust & corrosion inhibitors, friction modifiers and E.P. additive to provide excellent water repellency for rust protection and high antiwear and load carrying capacities. It is extremely resistant to all types of acid / alkalies and does not react in presence of them. It also acts as a soft sealant to prevent leakages of solvent vapor. 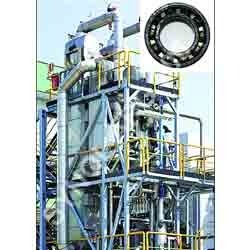 Area of Application:DT bearing Extractor bush, Pumps, Solvent tight conveyors, All joints etc. in Vegetable oil solvent extraction and Chemical plants, Acid & Alkali industry, Pumps, Joints, Flanges etc. Operate effectively in presence of solvents, acids & alkalies. Suitable for ... Aliphatic and Aromatic Hydrocarbons, Mineral Oils, Chlorinated Solvents etc. This is a heavy duty adhesive grease with high quality lubricating graphite flake used for heavily loaded bearing surfaces exposed to humid & hostile environment. It can be used for all slow moving heavily loaded bearing surfaces including plain bearings and some antifriction bearings. Typical applications would be large open gears, heavily loaded turn tables, pump plungers, wire ropes, chains, conveyors, elevator plungers, and guides, hoisting engines, winches etc. Additives ... Antioxident, Antiwear, Anticorrosion, Graphite etc. Looking for Chemical Plants Lube ?